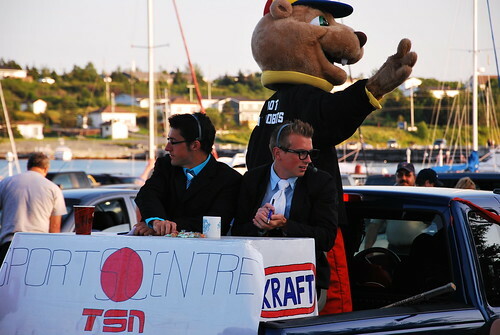 Bay Roberts – Kraft Celebration Tour – August 20th, originally uploaded by eracose. The Holdin’ Ground Festival and Klondyke Days in Bay Roberts are over for another year. With so many things still happening in the town and in the region, it seems more like a beginning than an ending. 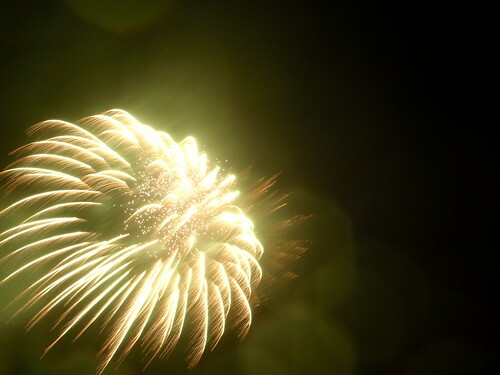 Even though it poured rain during the closing fireworks, there was a tremendous turn out and many said it was the best fireworks they had ever seen! 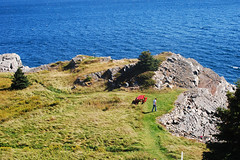 Perhaps, one of the most underrated tourist attractions in Newfoundland and Labrador is the Bay Roberts East Shoreline Heritage Walk [AKA Madrock Trail]. 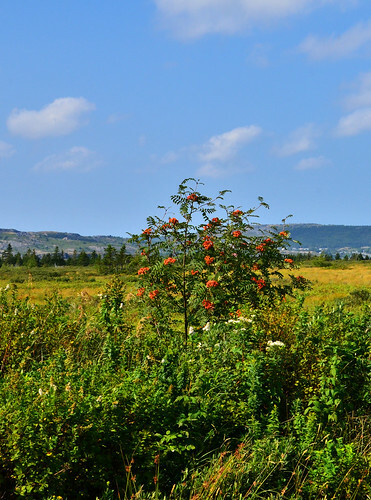 Many people who drive along the Conception Bay Highway, passing through Bay Roberts, are unaware of Bay Roberts East, the part of the town which is located on the tip of the Bay Roberts peninsula. The 4 km. 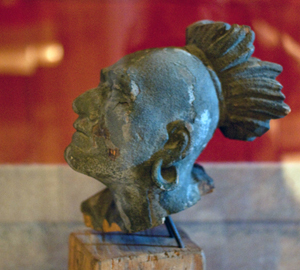 walk is through some of the most spectacular scenery in the province, and many of the features built by early settlers, such as root cellars, rock walls, and even an old cemetery have been preserved. The silence is striking. The only sounds are the cries of birds and the crunch of your foot steps. If you are a member of FaceBook or Flickr, you will see that each person who visits the Shoreline Walk comes home with amazing photos, that reflect what has impressed that particular individual. 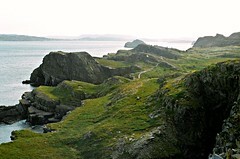 Some of the well- known parts of the trail are French’s Cove (the site of early settlement), Juggle’s Cove, and Fergus Island, which face towards Port de Grave and Bell Island, Madrock – from which you can see Bell Island (on one side) and Upper Island Cove (on the other), and the Three Sisters, which faces towards Spaniard’s Bay, Bishop’s Cove and Upper Island Cove. French’s Cove is the site of early settlement. The set of photos of French’s Cove was taken in the fall, and had an atmosphere that reminded me of fairy stories that I had heard. On the Flickr set, a number of fairy stories are include with the photos. Fergus Island is named after a prominent merchant in the community. From a certain angle, the island looks like a resting Newfoundland dog with its paws stretched in front of its face. 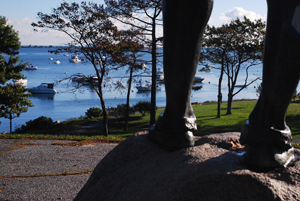 Madrock offers spectacular views of the ocean, especially when the winds are high. In this photo, Upper Island Cove can be seen in the background. From other angles, Bell Island can be clearly seen. 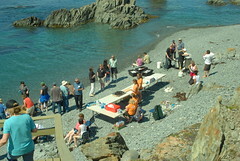 During the summer of 2010, the Bay Roberts Cultural Foundation is hosting another Mussel boil on the Beach on Sunday, July 11th. 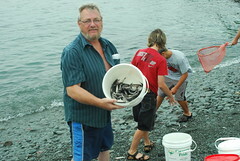 Families from town also come to the beach during the caplin scull. The caplin roll on the beaches, and families scoop them up to eat fresh or to salt and dry to eat year round. 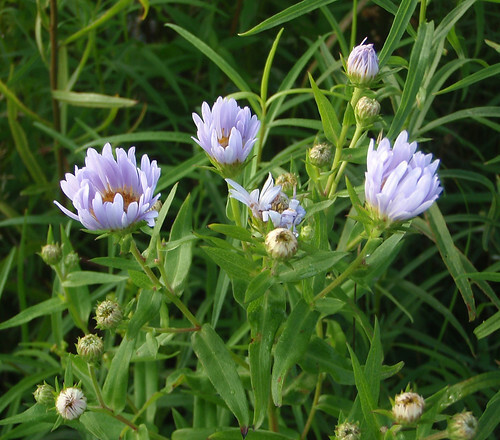 While you are in the Northern Avalon this summer, be sure to visit the Shoreline Heritage Trail. You can call the Bay Roberts office and ask for a guided tour. However, I think just following your own path, communing with nature and enjoying the scenery is an adventure. Neal O’Leary’s “Have You Ever Fell in Love” accompanies views of the Bay Roberts East Shoreline Heritage Walk. Tagged as Bay Roberts, Bay Roberts East Shoreline Heritage Walk, Caplin Scull, Hiking and Walking in Newfoundland and Labrador, Newfoundland and Labrador, Northern Avalon, Shoreline Heritage Walk, Three Sisters, town of Bay Roberts.